The Target List tab shows (lists) the targets in the current target list. Targets can be files, folders, and/or URLs. 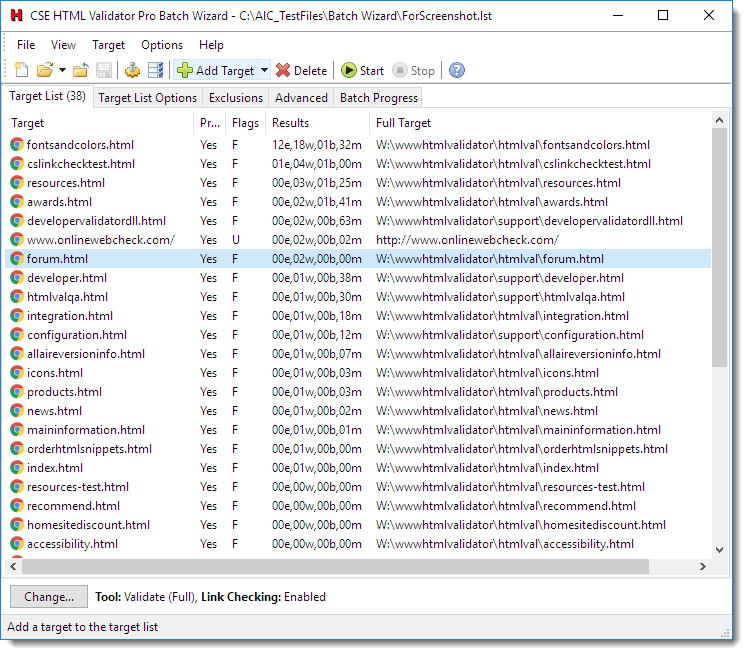 When a target list is processed by the Batch Wizard, the targets listed here are all processed (unless the target's process flag is set to 'No'). •Proc - this column can be 'Yes' or 'No'. Set to 'Yes' to process the target when the target list is processed. Set to 'No' to ignore the target. •Flags - this column gives additional information about the target. •P - for URLs: uses a username and password to download the URL. Note that the password used to download the URL is not stored securely in the *.lst file when you save the target list. •Results - This column shows the number of errors, warnings, bad links, and unique misspellings found during the last completed (not aborted) target list processing that used the validator tool (example: 05e,03w,05b,03m for 5 errors, 3 warnings, 5 bad links, and 3 uniquely misspelled words). Note that the number of bad links will always be zero unless link checking is enabled. Furthermore, the displayed number of errors, warnings, bad links, and misspellings is limited to two digits each, making 99 the maximum number that will be displayed. Note also that this column shows the cumulative number of errors, warnings, bad links, and misspellings for all the targets validated under the specific target. For example, if the target is a folder target that resulted in validating ten documents because the ten documents were in the folder, then the number of errors, warnings, bad links, and misspellings is the cumulative number of errors, warnings, bad links, and misspellings for all ten documents. Similarly, for targets where follow links is enabled, the results shown include the cumulative results of all documents followed for that target.